A Book of Years is an interactive journal and world timeline book, authored by your very own family. As you learn about each civilization from your history studies, you’ll add more and more to your book, until you’ve created an awesome story about what has happened over the history of the world. We sell ready-made Book of Years kits with timeline tags in our catalog. 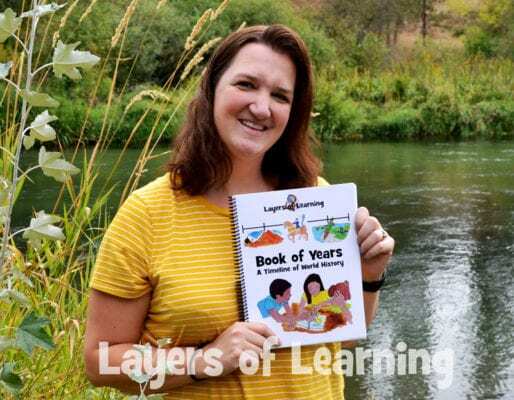 Pretty exciting to be holding the new Layers of Learning Book of Years! For years our family has kept a Book of Years that we add to at the end of each history unit. I love teaching history in the right order, and making a Book of Years has helped us to see the overall context of the world and make connections even more. I made our first Book of Years using an oversized 11″ x 14″sketchbook. We used rubber cement to adhere blue cardstock to the cover, and then I printed out some cover art I designed to adhere to the card stock. Here is our printable Book of Years Cover if you’d like to use it. Next, I used a ruler and measured 3 inches down from the top of each page and drew a light line, then cut along it, leaving it attached at the binding. This allowed us to record our timeline along the top pages and our entries in the larger bottom section. We can turn the pages independently of each other so that we can see the things that were happening in all the parts of the world at the same time in the timeline even though it wouldn’t fit on one-page spread. It took me a bit to figure out how to do the years along the timeline. The earliest parts of history are hard to manage because we don’t know much at all about the beginnings of the world, and the spread of years is huge during that time. We are religious, so we began with one page about the creation, Adam and Eve, Noah’s ark, and the Tower of Babel. The years along this page aren’t labeled. Then we put a year split mark, indicating an unknown passage of time, and then began recording the events from the Layers of Learning units as we came across them. After that page, we began with 3000 BC and had each 2-page timeline spread represent 100 years. When we reached the modern age I spread that out to 50 years per page since we’ll have so many modern events to include on our timeline. We create a little symbol for each unit and mark the symbol by the entries and also on the timeline so we can quickly see which civilization entries belong with. If we are recording a conflict between two groups of peoples the entries may have two symbols by them. The Persians’ symbol below represents the tomb of Cyrus the Great. You can see it on the page with the entries about Persia and also on the timeline items above. I have each of my kids write and illustrate at least one entry for each of the units. Sometimes we learn a lot of interesting things and do more, but usually, they just choose their favorite thing we learned from the unit to add to our Book of Years. We try to hit all the really important historical events, but we also include things that are just interesting to the time and people we are studying. I let the kids choose what their entries are, so we have a big variety of things. We love reviewing what we’ve learned using our Book of Years because the kids can see all their own work and they always get excited about it. It seems to trigger the memories of the projects we’ve done and what we’ve been learning. I love it too. It has become my favorite history book on our shelf. If you want to make your own Book of Years from scratch, you can follow Karen’s instructions and inspiration from above. We had an overwhelming response from people who asked us for more help in creating this cool history keepsake, and that’s why you can now get a ready-made Book of Years kit right in our catalog. We took the preparation and guesswork out of it so you can get right down to creating. 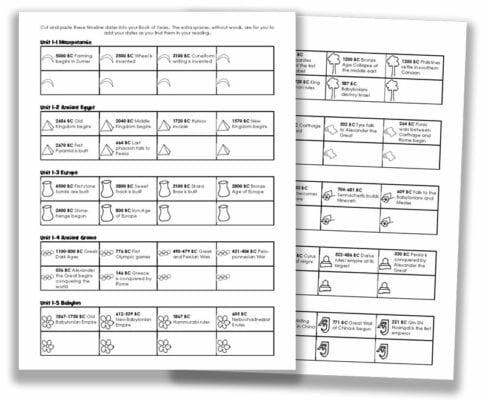 The kit comes with the timeline and timeline tags, civilization headings on each page, and coordinating symbols all built-in. You can create one book for your whole family, or have individual ones for each kid. Either way, we hope you love and treasure your Book of Years like we do! The Book of Years is a combined timeline and encyclopedia of world civilizations that you make yourself. It is a spiral bound paperback book that is aligned with the Layers of Learning history units. The mini timeline tags are included for your kids to cut out and paste into the book. Below the timeline, your children create entries about each civilization they encounter in their history studies. Click here to learn more about the Book of Years. The Books of Years functions as an interactive timeline journal that your kids get to create. 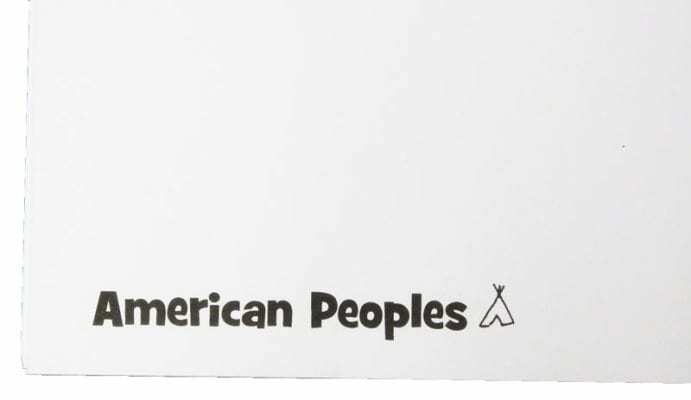 It is an 8 1/2″ x 11″ spiral-bound book with a coated coil binding. The pages are printed on 60# premium paper and the cover is high gloss 100# paper with outside lamination. Kids can fill it with drawings and captions and can even paste in clipart or other pictures as they learn about the civilizations that make up the story of our world. 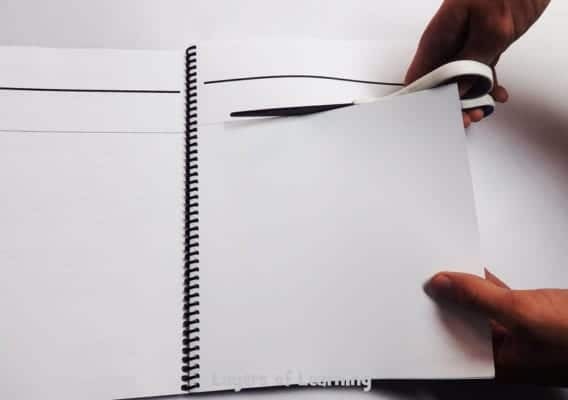 Start by cutting the pages on the dashed line with a pair of scissors. This will separate the timeline from the civilization portions of each page. You can cut just a few pages at a time as you work your way through the Book of Years. Each two-page spread corresponds to a civilization or time period in the Layers of Learning curriculum. 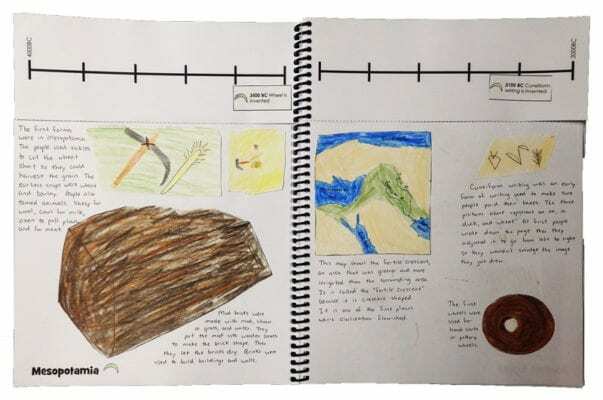 On each two page spread of the Book of Years, you will draw pictures and write captions and facts you have learned through books and videos and projects about the civilizations. The first two-page spread is “Prehistory”. It is for anything that occurred before 5000 BC. If you are religious you can draw in the creation. If you are not then you can add in dinosaurs, the formation of the earth, cavemen, or whatever you like. The rest of the pages have dates on a timeline at the top ranging from 5000 BC to 2030 AD. Two pages from 5000 BC to 3000 BC are a thousand years each. After that from 3000 BC to 1700 AD, each two-page spread covers a hundred years. From 1700 to 2030, each two-page spread is ten years of history. Timeline dates for each Layers of Learning history topic are included with the Book of Years in a 13 page printable. You cut out the dates and paste them on the timeline in the correct places. Each civilization or time in history has a symbol so that as you flip through the timeline you can remember which civilization each event goes with. The symbols are also at the bottom left of each page with the civilization title. There are extra timeline pieces so you can write in dates you find yourself through your studies. Yes, we end up with multiple bottom pages for each top section. We just have blank small upper sections at the end. But later in history, as we near the modern times you can have the timeline increments get smaller. Move from showing 100 years on a spread to showing a decade on a spread. I’m a bit confused, after reading the comment above, and how in your post you mention being able to see what was happening in the world at the same time. So you depend on the icons to connect the top strips and bottom pages? Would you make a time line both on the top and on the bottom pages? 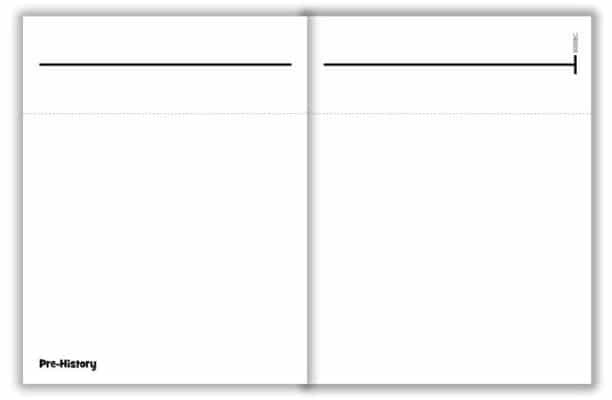 I am curious as to the purpose of having separated pages into top and bottom parts – couldn’t you use full pages, and title them with a certain year span, and title the next double spread with the same year span if more than one double spread is needed? I am sincerely trying to understand the pros and cons. Thanks! Mimi, we put the timeline on the top and entries on the bottom. You could keep them together as you suggested, but the reason we don’t is that there is often so much happening in a hundred year span. Our entries are topical (we include several things about ancient Greece in a series of entries on one page). At the very same time there were other civilizations in other parts of the world. We couldn’t fit them all on one page of entries, but we can put a little mark on the timeline for them. Basically, as we add the date on the timeline it might say, “Ancient Greek civilization flourished.” Below it would have entries for Greek gods and goddesses, the Parthenon, Greek pottery, the firrst Olympics, etc. The Phoenicians lived at the same time. We would have another set of entries about them, but on the timeline we could show them together so the kids can see how even though we learned about them in different units, they were happening at the same time and coexisting and trading with Greece. There were also civilizations in many areas of the world flourishing at the same time. They each get their own entries. The little icons just help us to quickly find the entries that go along with it should we need to. The other advantage to separating them is that as you get into more modern years, you can spread out the timeline years and take advantage of the extra little half pages you have. Can you imagine putting the events of a hundred years of U.S. history on a little timeline? We change the spread for modern history so we can include more. Does that make sense? You could absolutely do it the way you suggested too. We just wanted an even spread of the years up until modern history, so I did the math and this is how it worked out. There are centuries that we have very little record of and others that are jam-packed. This allowed us to not have empty nor overly full pages. You don’t have to follow this style though. It’s just what we like. And we LOVE our Book of Years. How many pages does your notebook for the book of years have? I found one the same size, but want to make sure there are enough pages!